At the beginning of 2005 there was a new addition to the Jenlain family, in the form of a special beer with 7.5% alcohol by volume. 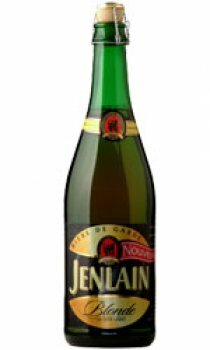 Little sister of the majestic Jenlain Ambree, this queen of beers, Jenlain Blonde is high on taste, like any self-respecting blond beer. A happy event for all traditional blond beer enthusiasts! Kept for 40 days in the vat, it matures slowly to release its full aroma and develop a fine, long-lasting head. After filtration, it takes on a splendid golden hue and is best enjoyed when served chilled at between 6 and 8 degrees centigrade. Packaged in the same way as its illustrious forerunner, declared Taste of the Year 2006 and winner of a Silver Medal at the 2006 Paris Agricultural Show, Jenlain Blonde has been so successful that Brasserie Duyck is now selling it in six-packs of 25cl bottles and in 50cl cans. Yet another example of how the brewery remains faithful to its values of authenticity and modernity.